Is Demaryius Thomas out of Peyton Manning's range? We use analytics to find out ... and more. This story appears in ESPN The Magazine's September 28 Transactions Issue. Subscribe today! SURE, DEZ BRYANT'S franchise tag drew most of the coverage on March 2, but the receiver was just one of six pros tagged that day -- and for Demaryius Thomas, Justin Houston and Stephen Gostkowski especially, million-dollar questions still loom. 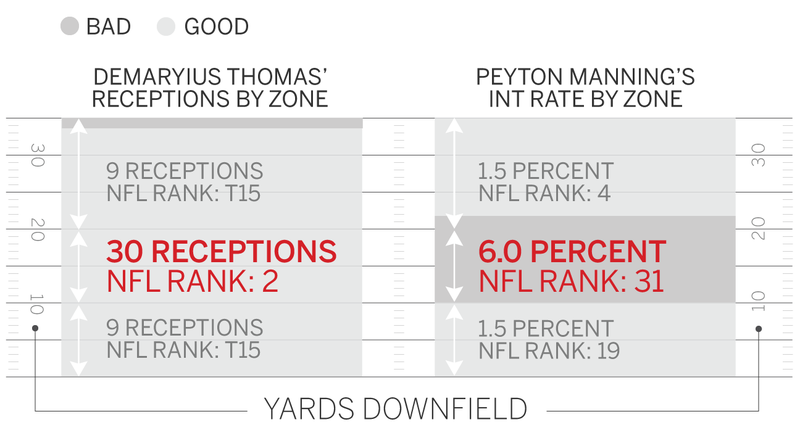 IS DEMARYIUS THOMAS OUT OF PEYTON MANNING'S RANGE? What do 297 catches (No. 3 from 2012 through 2014), 4,483 receiving yards (No. 2) and 1,874 yards after the catch (No. 1) add up to? For Thomas, the total is $70 million -- a contract, signed on July 15, decreeing him one of the NFL's most valued targets. But here's the catch: Even if he's worth the big bucks, the Manning-to-Thomas connection might not be. Consider: Only three receivers racked up more yards on vertical passes (thrown 11-plus yards downfield) than Thomas last year (965), and his 30 grabs on medium-range lobs (11-19 air yards) ranked second. Unfortunately for him, that's no longer Manning's sweet spot. Despite having Thomas as a target, Manning struggled on medium-range throws: No. 17 in ypa (9.9), No. 21 in QBR (78.1) and dead last in INTs (8). And that last mark is why Manning, just two years after ranking fifth, finished 32nd in bad decision rate (4.5 percent) -- how frequently a QB makes a mental error that leads to a turnover opportunity -- on passes thrown 11 to 19 yards downfield. His seven bad decisions? Worst in the league. In 2014, Thomas excelled where Manning regressed. IS JUSTIN HOUSTON REALLY WORTH $101 MILLION? When the Chiefs inked Houston for $101 million over six years on July 15, they made their QB tormentor the richest linebacker in NFL history. Sure, they paid a premium for the 26-year-old, after failing to extend his rookie deal prior to his 22-sack tear in 2014. But with OLB Tamba Hali turning 32 in November, the team was hell-bent on not losing the ascending pass rusher (44 total pressures in 2012, 59 in '13 and 85 in '14, per Pro Football Focus). Still, was Houston overpaid? A market value threshold for elite pass rushers can be determined by comparing expected points added (a defender's impact on the net score for plays in which he was involved) to adjusted cap hit. 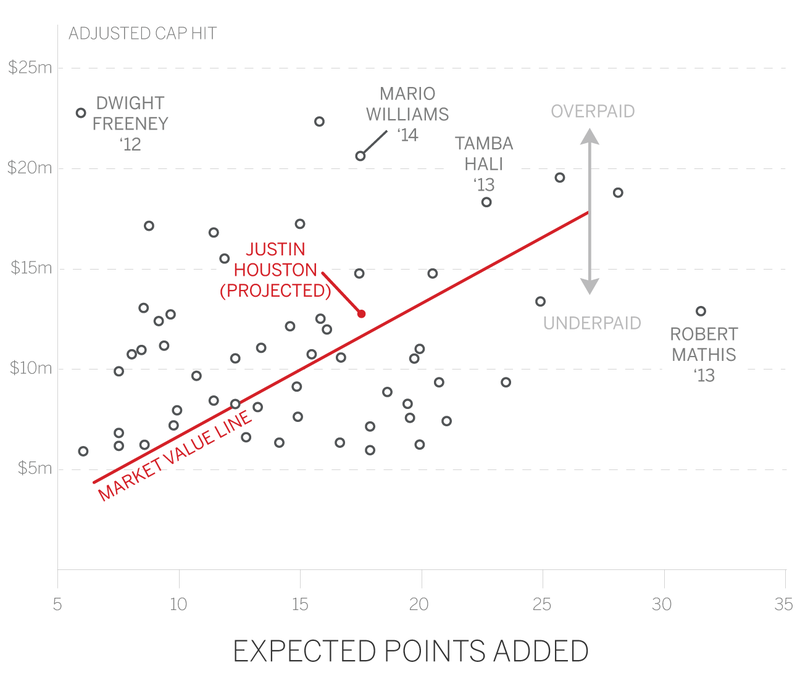 That production vs. cost index reveals that, yes, Houston falls just a notch over the line. 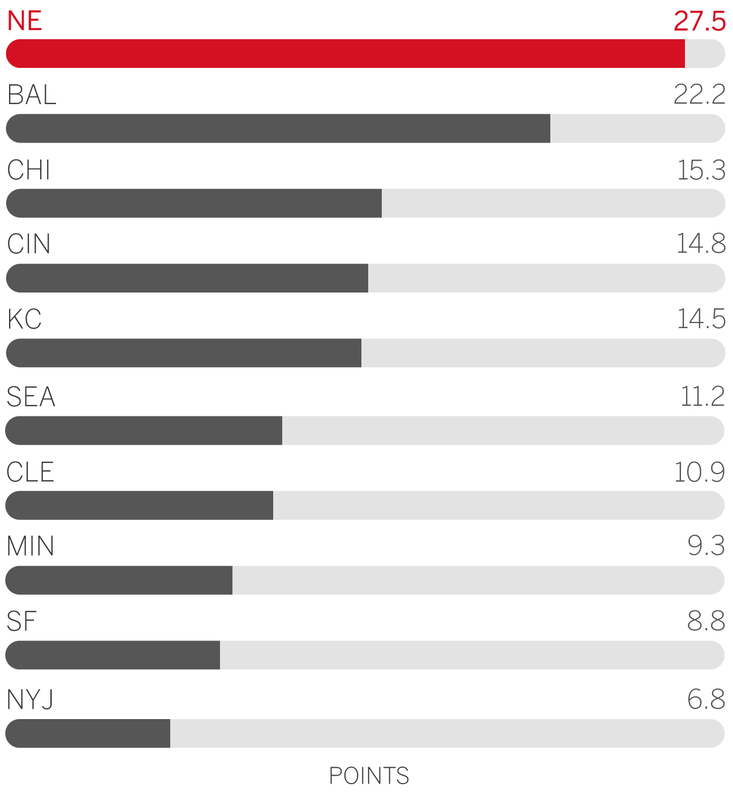 The Chiefs paid too much -- but just barely. *All 54 DEs and OLBs since '12 with at least five sacks in a $5 million-plus cap hit season. WHY IN THE WORLD WOULD THE PATRIOTS FRANCHISE THEIR KICKER? The Patriots call Devin McCourty the QB of the defense -- and they all but dared him to leave on March 2. With the safety nearing free agency, New England instead franchised ... Stephen Gostkowski and then made him the NFL's highest-paid kicker ($17.2M). Yes, a week later, McCourty spotted the Pats a family discount ($47.5M over five years), but why even risk it in the first place? Turns out, no team values special teams as much as New England or gets more value from them. The Patriots have franchised a kicker three times, most in the NFL. In 2006, they drafted Gostkowski in the fourth round, making him one of just four kickers since '03 to go that high. And they're the lone team to draft a long-snapper since '09, doing so twice. *Values adjusted for weather and altitude.